A key lobbying group is proposing changes that would reduce federal nutritional standards that former first lady Michelle Obama implemented with the Healthy, Hunger-Free Kids Act. The School Nutrition Association released its Federal Nutrition Standards recommendations in early March, and Newsweek reports that it is asking the Department of Agriculture to allow more flexibility in healthy meal planning for student lunches, including allowing food items that are naturally higher in sodium on school lunch menus and returning grain requirements to former standards. In its recommendation, the SNA said the program’s “overly prescriptive regulations” may be the cause of reduced student lunch participation and increased costs and waste. SNA suggested federal nutrition standards be modified to include “nutritious meals that appeal to diverse student tastes” and options that students enjoy with their families like white rice, grits, pasta, tortillas and bagels. Republican lawmakers including House Freedom Caucus Chairman Mark Meadows of North Carolina support the group’s request. Meadows included the Healthy, Hunger-Free Kids Act in a list of more than 300 executive orders, rules and regulations that the Trump administration should consider cutting in the first 100 days, Newsweek reports. The Healthy, Hunger-Free Kids Act, which was launched in 2010, advocated for student lunches to consist of foods low in sodium and fat and paired with low-fat milk, vegetables, and only half a serving of whole grains and fruit as part of an effort to reduce childhood obesity and promote healthy eating habits among students. As Newsweek notes, when the program rolled out at the start of the 2012-2013 school year, it was met with a less-than-enthusiastic response because students were disappointed that their french fries and soda had been replaced with the healthier options. 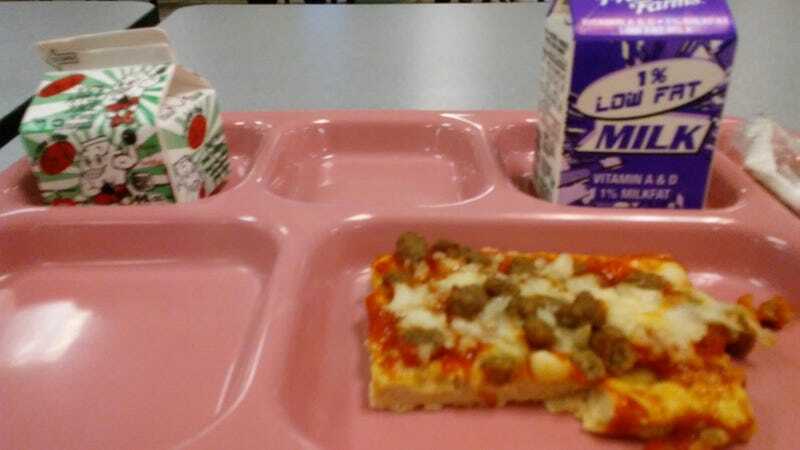 In November 2014, students started the hashtag #ThanksMichelleObama on Twitter, sharing photos of their less appetizing school lunches.